To see my rating on any of the books click on the Goodreads button on the right. In the previous post about Bones of Empire I wondered what kind of mind could come up with such a horrible alien villain. After reading Monster Hunter Vendetta by Larry Correia I wondered what kind of out of this world mind came up with the monsters in this book. There are some really weird creatures, both good and bad, in Monster Hunter Vendetta. Owen Zastava Pitt found out there were really monsters when a year ago his boss turned into a werewolf and tried to kill him. That is when Owen became a member of Monster Hunters International, met the love of his life Julie Shackleford, found out his mother-in-law to be was a vampire (not the nice kind in other books and on TV) and helped save the world from a truly horrible fate. Now a year later he is enjoying life while going out on routine monster kills. Then a Shadow Monster releases the undead while attempting to capture Owen. Owen is thrown in a Mexican jail, his mother-in-law to be comes to visit him, and the Monster Control Bureau breaks him out. All hell is about to break out and Owen’s nice quite year of routine monster hunts ends. Get ready for another non-stop exciting ride. There are more great characters, more danger, and a lot of past history in Monster Hunter Vendetta. At the end of the book we also know there is more to come in this series. Look for Monster Hunter Alpha in August of 2011. Baen published Monster Hunter Vendetta by Larry Correia in 2010. I purchased Monster Hunter Vendetta from Baen as an eBook. It is one that has been on my eBook TBR pile for several months. Just a Footnote: This February there is a free short story by Larry Correia set in the Monster universe on the Baen Web Site. The alien in Bones of Empire by William C. Dietz was so terrible it made me wonder what kind of mind had the imagination to create something that awful. The Sagathies are a shape-shifting species that are so vicious that they are confined to a prison planet. Unfortunately two of the Sagathies have escaped. Because the Sagathies are such a threat to the Uman Empire there are cops who are bioengineered to see through the shape-shifting guise of the Sagathies. Jak Cato is one of those cops. Cato has just been assigned to Corin the capital of the Uman Empire. When Cato catches a glimpse of Emperor Emor he sees that it is Fiss Verafti, a Sagathie shape shifter thought to be dead. 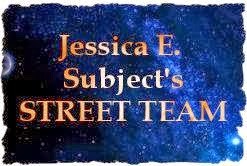 What follows is a dangerous adventure that leads Cato to a planet where a female shape-shifter has established a religion that worships her. If she and Fiss take over the planet they will hunt down, kill and eat everyone on the planet. While Cato is trying to catch and kill the Sagathies he is also dealing with a few of his own personal issues. The main one is the lovely Alamy, a slave he owns and has promised to free. Bones of Empire is part of a Duology about the Uman Empire. While I have read several of William C. Dietz’s books I have not read the Empire Edge's, the book that precedes Bones of Empire. Because there is enough back-story woven in I had no trouble keeping up with the action in Bones of Empire. Bones of Empire is a fun Science Fiction read. It has a horrible villain, great action, a well-developed world and a touch of romance; in other words, something for everyone. I checked Bones of Empire out from the Rogers Public Library. I found the recommendation for Point of Honour and Petty Treason by Madeleine E. Robins on John Hemry’s web site when I was looking for information about his upcoming Black Jack Geary book. When I went to Amazon to purchase I found that Point of Honour released in 2003 was out of print, and Petty Treason released in 2006 was the only other book listed in the series. After doing some research I was happy to find the following posted 02-02-2011 on Madeleine's Live Journal. Like the Sebastian St. Cyr Mysteries, Point of Honour is set in the Regency Period and has a touch of romance to go with the mystery. However, it is missing the trademark HEA of a Regency Romance. Madeleine Robins has also chosen to change some of the history of the period and explains those changes in A Note of History and Thanks in the back of Point of Honour. Sarah Tolerance is the main character in Point of Honour. Sarah ran away with her fencing master when she was sixteen, lived with him until he died but they never got around to getting married. As a result she is a Fallen Woman. To quote Madeleine Robins “It is a truth universally acknowledged that a Fallen Woman of good family must, soon or late, descend to whoredom.” Sarah chooses to make a life for herself outside of that expectation. Upon returning to England after the death of her fencing master she becomes an Agent of Inquiry instead of a courtesan. She uses her skill with a pistol and sword as well as her sharp mind to become a private investigator known for being discreet. Because of her background she can “float between social layers, unearth secrets, find thing that were lost, and lose thing too dangerous to be kept.” As Point of Honour opens Sarah has finished a case where a wife who holds the purse strings hires Sarah to find out where her husband is hiding his latest indiscretions using her money. Sarah’s next case starts when The Earl of Versellion asks her to find a Italian fan that was given by his Father to his mistress 20 years ago. What Sarah uncovers leads to murder and betrayal. Look for more than a few twists and turns as the story progresses. Point of Honour is a great start to a series. Madeline Robins has taken a slice of Regency England, filled it with great characters, a wonderful plot and many possibilities for future novels. TOR published Point of Honour by Madeleine E. Robins in 2003. Point of Honour is out of print. I purchased it used through Amazon . The Queen’s Man is set in the English Court during the time King Richard is being held for ransom and his brother John is plotting to take the throne. 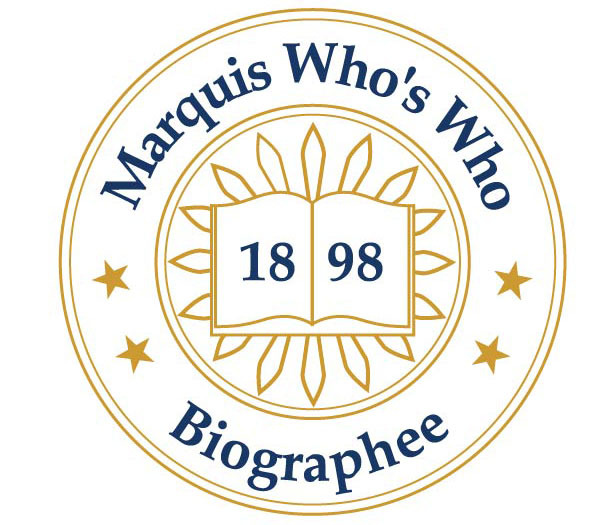 Justin de Quincy finds out that his father is the Bishop who raised him as an orphan. This discovery leads Justin into a situation without money or prospects and he starts for London where he might find a job as a scribe. On the road he hears a cry for help and recues a merchant and his servant from robbers. The merchant is gravely wounded and before he dies asks Justin to deliver the letter he is carrying to London to Queen Eleanor. The letter tells Eleanor that her son Richard is alive and being held hostage. Eleanor takes Justin into her service and sends him to find out who hired the men to attack and kill the merchant carrying the letter. Suddenly Justin is in the middle of the politics between Eleanor and her son John. The path takes Justin from Winchester to the lowest parts of London as he follows the trail of the men hired to kill the merchant. He finds that he has trouble telling who is a friend and who is an enemy. Through out it all he is the Queens Man and brings the truth to Eleanor. Sharon Kay Penman has written several historical fiction novels set in this same time period. This is her first mystery novel and she has used her research to good advantage. While the story is fiction the historical characters and events are portrayed with great accuracy. The Queen’s Man is set in a time of great turmoil and there are many good mysteries left of Justin to solve. The Queen’s Man is a great start to a mystery series . Henry Holt and Company published The Queen’s Man by Sharon Kay Penman in 1996. The Queen's Man is out of print. I checked out The Queen’s Man from the Rogers, AR Public Library. The Apothecary Rose is the first book in The Owen Archer series. Unlike Margaret Frazer’s books, Candace Robb mixes national politics and everyday life in her Owen Archer series. Owen was the captain of archers for the Duke of Lancaster until he was blinded in one eye. The Duke saw something in Owen and trained him to act has his spy. When the Duke died John Thoresby, the King’s Lord Chancellor and Archbishop of York approached Owen with an offer to take Owen into his service. When Owen accepted his first job was to travel to York and look into the death of Sir Oswald Fitzwilliam, the Archbishop’s ward. It seems that Fitzwilliam was not a popular man and Thoresby wanted to make sure his death was by natural causes not murder. As a cover for his investigation Owen poses as a solider that has lost the heart to continue and is looking for a new way to make a living. Owen has knowledge of herbs and healing from his years as a solider. York’s Master Apothecary Wilton is unable to work and Owen joins Wilton’s wife Lucie as an apprentice. That puts him right where he needs to be to discover a series of events from the past that lead to murder in the present. The Apothecary Rose has a great cast of characters, a wonderful plot, and a historically accurate setting. All in all it is a great start for a mystery series. I really liked this series and have already been to the library to check out the next book The Lady Chapel. 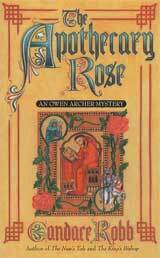 St Martin’s Press published The Apothecary Rose by Candace M. Robb in 1993. I checked out The Apothecary Rose from the Roger, AR Public Library. There is another free ebook at Carina Press today. Follow this link to download The Spurned Viscountess by Shelley Munro. This is a great way to try a new author. The Sister Frevisse series is set in the fifteenth century and revolves around the small village of Prior Byfielf and St. Frideswide’s Abby. 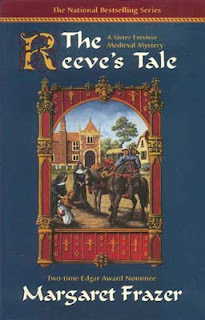 The Reeve’s Tale is the 9th book in the series. The way the book was written I could not tell that I was starting in the middle of a series. I really liked this book. Margaret Frazer has researched her subject and tries to stay true to village and convent life in the fifteenth century. She includes notes in the back to let the reader know what is historically true in the book. Among the things she includes are disputes taken from actual records of the times. The story in The Reeve’s Tale is very complex. Just as I though I knew what had happened a new twist showed up. Simon is the village Reeve (the person who hears and settles disputes) and when there are two murders he is one of the people accused. Simon’s counterpart at St. Frideswide’s is accused of being a runaway villein (a person who belongs to another Lord) and is removed from his office until he can clear his name. Sister Frevisse is chosen to take his place. During this time a measles epidemic forces Sister Frevisse to stay in village helping nurse the children. In addition to serving as a nurse she must also try to find out how two of the villagers met brutal deaths. Sister Frevisse is a very low-key character that gets results by asking the right questions at the right time. As a nun she has more power than most women but still has to work to keep from being shoved into the background and ignored. I found it fascinating to see how the balance between village, Lord, King, and Church played out. The world of medieval England was much more complex than I though. This is a series I will continue to follow. Berkley Prime Crime published The Reeve’s Tale by Margaret Frazer in 1999. I checked out The Reeve’s Tale from the Rogers, AR Public Library. I recently saw where the Brother Cadfael mysteries series has been released on DVD. After watching the series on TV I read and loved all of the Brother Cadfael books. The books were written by Ellis Peters. Some of the books are still in print but other are only available used. Brother Cadfael is a monk in 12th century England. He came to the monastery late in life. He was a soldier in the Crusades, has traveled the world and there have been women he loved in his life. As a monk his spends his time growing herbs and treating the sick and injured. Because of his background he is more in touch with the problems of the people outside the monastery and is quick to offer his help, sometimes to a couple in love and sometimes to solve a murder. The books have a great cast of characters. Cadfael is assisted by a novice Oswin, hindered by his abbey’s prior, and often assists the local sheriff, Hugh Beringar. They also offer a look at life in a time very different from our own. I have always enjoyed mysteries set in medieval times. Reading the article about Brother Cadfael sent me to the library looking for other mysteries set in this time period. Watch for my next three post to see what I found. 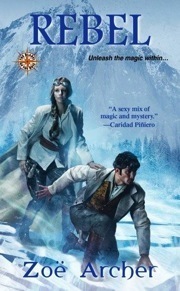 I just finished Rebel and Stranger, the last two books in the Blades of the Rose series. Rebel introduces Nathan Lesperance and Astrid Bramfield. Nathan is a Native attorney in Canada and Astrid is a former Blade of the Rose who retreated to the Canadian wilderness after her husband Michael died in her arms. The Heirs have activated the Primal Source. One result is that all magic has become much more potent. When the Heirs capture Nathan he uses magic he did not know he had to escape. Astrid finds him alone and confused in the wilderness. They have to depend on her skills to stay alive and ahead of the Heirs. Stranger brings Gemma Murphy, female reporter, and Catullus Graves, inventor, together. Gemma senses a great story and has followed Catullus, Nathan and Astrid from Canada. When the Heirs see her with Catullus he has to protect her from harm. Their attraction is immediate but has to be put on hold while they try to find a way to stop the Heirs from fully activating the Primal Source. This is the final book in the Blades of the Rose Series and look for some interesting characters out of history and mythology. I admit I liked the first two books, Warrior and Scoundrel, more than I liked Rebel and Stranger. The characters in all of the books were great and the plot moved in all four. I though the first two books were more action driven than the last two. Even so I recommend the series. I would start with the first book, Warrior, and read the series in order. Zebra published Rebel and Stranger by Zoe Archer in 2010. I purchased Rebel from Borders and Stranger as an ebook from Barnes and Noble. The Battle for Commitment Planet finds Michael Helfort between a rock and a hard place. Anna has been captured and is being held prisoner on Commitment, the capital of the Hammer Worlds. Michael has been a real thorn in the Hammer Worlds and DocSec’s side and Anna’s capture is being used to get to Michael. DocSec has given Michal three months to turn himself over or Anna will be raped, beaten, shot and dumped into the DocSec lime pit. Neither option is acceptable to Michael. When Michael finally shares what has happened with his crew they decide to rescue Anna and the other Federation prisoners held on the Commitment Planet. All know that this is a one-way trip. After the rescue the plan is to join the opposition on Commitment and help overthrow the current Hammer government. The Battle for Commitment Planet is another fast paced military adventure. Don’t look for any resolution to the war between the Federation and the Hammers in book four. The action in The Battle for Commitment Planet sets up the next stage in the war with Michael still in the middle of the action. 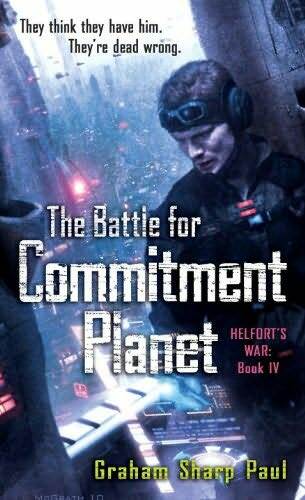 Random House published The Battle for Commitment Planet by Graham Sharp Paul in 2010. I purchased The Battle for Commitment Planet from Amazon. I just ran across this. Carina Press is giving away a free eBook every Wednesday in February. Follow this link to see what is being offered. Wednesday Feb. 9th is Silver Bound by Ella Drake. Wednesday Feb. 19th is The Spurned Viscountess by Shelley Munro. Wednesday Feb. 23rd is The Seven Fold Spell by Tis Nevitt. All look like great books to add to any collection. In Clockwork Heart Dru Pagliassotti has created a fascinating world. Ondinium is a city built around the mountain that contains The Great Engine. The Great Engine and other lesser engines are computers that run on punch cards and are powered by steam engines. The population of Ondinium is divided into castes. The highest caste, the Exalted, remained masked and never speak in public. There are distinctive marks on the faces of each caste. Only the Icarus deal will all castes and are considered out of all caste. The Icarus wear wings that allow them to fly and they are the ones who deliver all messages in Ondinium. Ondinium is the envy of all of its neighbors, neighbors who spy to try to steal the secret of the engines that allow Ondinium to prosper. Taya is an Icarus and Cristof is an out of caste Exalted who has chosen to live and work among the lower castes, keep his face uncovered, and build and repair clocks. Fate throws the two together as two different plots against Ondinium collide. The two start out as antagonist but find that they share more than either would have expected. 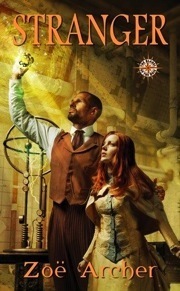 In addition to the fascinating world of Ondinium Clockwork Heart has a large supply of great characters and a well-developed plot filled with thrilling action. Dru Pagliassotti put a great deal of effort into building the world of Ondinium. I wondered if she was going to write other books set in this world but as far as I can tell Clockwork Heart is the only book set in this world. 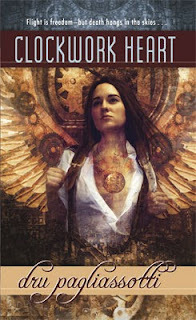 Juno published Clockwork Heart by Dru Pagliassotti in 2008. I purchased Clockwork Heart from Fictionwise. Yes, this is one of the ebooks that remained unread until I found it in the library. I’m very glad I did because it is a very good read. On a recent trip to the library I checked out and read two books that had been sitting in my electronic TBR pile for quite a while. One was on my EBookwise Reader and the other was on my Nook. Both had been pushed back and forgotten. I love reading on my eBook readers but I have realized that many times I will read paper copies before I read electronic books. I strongly suspect that if I had not found both books at the library both might have remained in my TBR pile. It is easier for me to ignore or forget an electronic copy of a book than it is to ignore or forget a paper copy. I wonder if others have found they do the same? I have several bird feeders in my backyard and love to watch the birds that come to eat. Since today is another snowy day here in the Arkansas Ozarks I though it would be a good time to mention my favorite birding books and to post some pictures of the birds visiting my backyard during the current snow. Even though I consider myself just a backyard birder when I was RVing I always joined any birding hike that was offered and put each of these books to good use when I was someplace where bird watching was possible. There are two volumes of Peterson Field Guides, one for the Eastern Birds and one for the Western Birds. The birds are listed in categories with a color plate of each bird, a short description of the bird, its song and its range. In the back of each volume there is a map that show the normal range of different birds. Peterson Guides are close to standard paperback size, are easy to use at home and easy to carry when you are out birding. I still have two copies of each volume, one I used at home and one I carried with me in the RV. Both are marked with the time and place I first saw a bird. I found The Audubon Society Master Guide to Birding - 3 – Old World Warblers to Sparrows in a used books store on one of my RV trips. While Peterson’s has color plates showing each bird in most cases the Master Guide to Birding has actual photos of each bird. There is also a more detailed description of each bird. The description of song and range is much the same but the map of the birds range is on the same page with the rest of the information. For species that were similar I found that by using both guides together I was better able to identify the birds that I saw. Houghton Mifflin published Peterson Field Guides Eastern Birds and Peterson Field Guides Western Birds by Roger Tory Peterson. There are several editions. My Eastern Guide is 1980 and my Western Guide is 1990. Alfred A. Knopf published The Audubon Society Master Guide to Birding 3 – Old World Warblers to Sparrow , by John Farrand, Jr., Editor in 1983. All three of the Audubon volumes are out of print but can be found used.